SBI presents a handy mobile app which can perform almost all of the banking operations from a customer’s perspective. SBI Mingle App is full fledged with features like instant balance check, mini statement, fund transfer, cheque book control, mobile alerts, card blocking and much more. 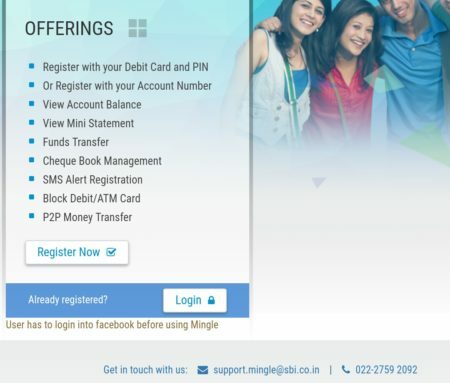 SBI Mingle App offers free signup and referral credits worth Rs. 20. New users on a successful registration gets Rs. 10 directly in their bank account. Also, users get Rs. 10 via refer and earn scheme. Free referral and signup credits are valid for limited time.Earn free money with SBI Mingle Refer and Earn Program . Also Check SBI Rewards App and SBI Buddy App Offers. 2. Login with genuine Facebook or Twitter account. 3. Now click on use now as shown in the picture below. 4. Hit the register now button as below. 5. Signup via bank account number or debit card number. 7. On a successful registration, user gets free signup credits worth Rs. 10. 1. Log into the app with genuine id. 2. From main menu get your unique referral code. 3. On each successful registration via referral code a user earns Rs. 10. 1. Signup credits are automatically provided with in 48 working hours. 2. Users also get their unique referral code via message after the registration.